Sergio Parisse managed to score for Italy but France proved too much for Conor O'Shea's men. France earned a much-needed victory and condemned Italy to the Six Nations wooden spoon on Saturday with a convincing 40-18 triumph in Rome. Defeats to England and Ireland all but ended France's hopes of winning the championship prior to their visit to Stadio Olimpico, while Les Bleus were also in danger of slipping out of the top eight in the world rankings ahead of May's pool allocation draw for the 2019 Rugby World Cup. However, although Italy skipper Sergio Parisse opened the scoring, France earned a welcome lift - and a first away win in the competition since their last visit to Rome two years ago - as Gael Fickou, Virimi Vakatawa, Louis Picamoles and Brice Dulin crossed to secure a bonus-point triumph. Italy caused a significant stir at Twickenham a fortnight ago before going down 36-15 to England, enjoying success with their tactic of not committing players to rucks and therefore preventing an offside line from being formed. The same tactical plan was adopted on an occasional basis against France, but it had little effect this time around, the hosts falling to an 11th successive Six Nations defeat. Italy made an energetic start and were rewarded in the third minute. Carlo Canna, starting at fly-half in place of the injured Tommaso Allan, dummied through a gap before passing out of contact for the supporting Parisse, who was left with a simple finish. Camille Lopez and Canna exchanged penalties before France found their stride to claim the lead. A break down the left from Vakatawa failed to yield a try, Guy Noves' men instead having to settle for a second Lopez penalty, but France crossed the whitewash from their next attack - a scintillating move from deep. After Dulin, Remi Lamerat and Vakatawa had combined in slick fashion to gain considerable yardage, Fickou found a gaping hole in Italy's defence to surge under the posts, Lopez's subsequent conversion taking the score to 13-8. There were further three-pointers from Canna and Lopez prior to the interval, ensuring France remained five points to the good. Lopez split the points again early in the second half, while Italy were grateful to Edoardo Padovani as the full-back produced a superb covering run and tackle to stop Vakatawa after the wing had streaked clear down the left. Vakatawa was over soon after, however, powering through weak tackling to justify France's decision to turn down another three points and kick to the corner. 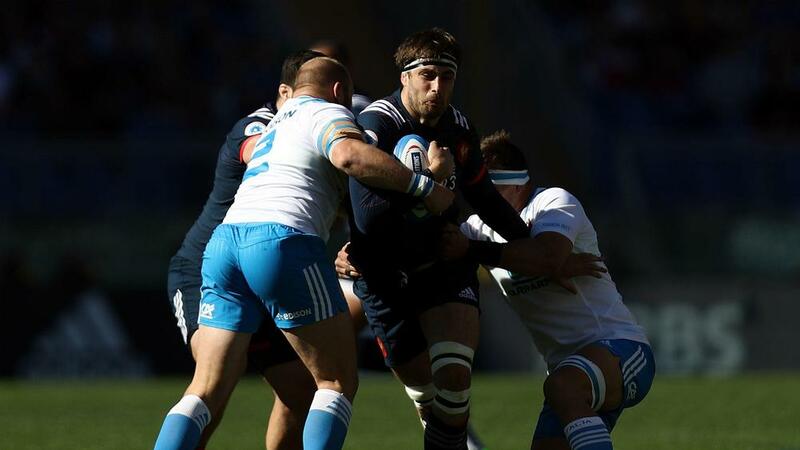 Italy were denied a second try of their own when the TMO ruled that Giorgio Bronzini had been held up over the line by Dulin and Picamoles. A further blow for the home team saw Michele Campagnaro withdrawn with an apparent shoulder injury and Picamoles - so impressive throughout this tournament - deepened Italy's misery by charging over to end the game as a contest. Eddy Ben Arous saw a try chalked off due to Picamoles being in touch, but France were not to be denied a bonus point, secured by Dulin prior to an 81st-minute Angelo Esposito score that represented scant consolation for Italy.